In the summer, your kids will most likely spend a lot of their time outside. They’ll probably be busy swimming, hanging out with their friends, and playing sports. While they’re enjoying the warm days, you’ll want to be sure that they’re protected from UVA and UVB rays. It can be tough to find a safe sunscreen for your kids at the drugstore. Many sunscreens use harmful chemicals, while others don’t provide enough sun protection. When you’re shopping for sunscreen, use these tips to help you find a product that will keep your kids protected all summer long. There are a few different ingredients that you should try to avoid when you’re shopping for a safe sunscreen. These ingredients often have harmful side effects, and they do not provide the protection your child needs. One of the ingredients that you’ll want to avoid is retinyl palmitate. Retinyl palmitate is a form of vitamin A. Scientists in the U.S. government studied this chemical, and they found that it may speed up the development of skin tumors when it’s applied to skin in direct sunlight. It may also lead to excess skin growth. Many manufacturers have now stopped using retinyl palmitate in their sunscreen. Still, it’s a good idea to double-check the ingredient list on your sunscreen to ensure that this harmful chemical isn’t there. You’ll also want to avoid getting a sunscreen that contains oxybenzone. This chemical does blocks UVA and UVB rays, but its downsides outweigh its benefits. Oxybenzone is a hormone-disrupting chemical that can potentially affect the nervous system. Some laboratory studies have also linked it to skin cancer. In addition, you’ll want to avoid sunscreens that have parabens and fragrances. If your child has sensitive skin, these ingredients can irritate their skin. Plus, parabens in sunscreen may react to UVB rays and potentially cause DNA damage in skin cells. 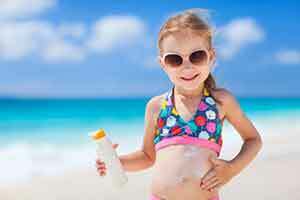 To get the best protection possible, you’ll want to buy broad spectrum sunscreen for your kids. Broad spectrum sunscreen protects against both UVA and UVB rays. UVB rays are the sun rays that cause visible sunburn, while UVA rays cause most of the damage below the skin. If you get a broad spectrum sunscreen, your kids will be protected from both types of the sun’s rays. Physical sunblocks are a good choice for anyone who worries about all of the chemicals in sunscreen. Physical sunblock is an old-school type of sun protection that’s starting to make a comeback. Sunblocks are also popular with lifeguards and other people who spend most of their working day in the sun. When you put sunblock on your child’s skin, it will leave a chalky white residue. This residue is highly reflectively, and it will block the sun from hitting your child’s skin. Physical sunblocks are typically made from zinc oxide or titanium dioxide. Zinc oxide provides slightly better protection than titanium dioxide. This is because zinc oxide is able to block out long UVA rays and UVB rays, while titanium oxide can only block short UVB rays. Some zinc oxide sunblocks are also combined with other UVB blockers. This gives the sunblock broad spectrum protection capabilities. The one type of physical sunblock that you should avoid is nano zinc oxide. This is a new type of sunblock that’s supposed to leave less white residue on your child’s skin. It does this by using nanoparticles, but it’s still unclear if these nanoparticles are safe to use. Some scientists worry that the nanoparticles could pass into your skin and damage your tissue. The nanoparticles may also have higher photoreactivity than coarser particles, which could lead to cell damage. Until there’s a clearer consensus about what these nanoparticles can and can’t do, it’s best to buy non-nano zinc oxide. When many parents are shopping for sunscreen, the first thing they look at is the SPF number on the bottle. In the drugstore, you’ll see sunscreens with SPFs ranging from 15 to over 100. While it may be tempting to reach for the sunscreen with the biggest number, there’s really no need to get a sunscreen with an SPF over 50. In fact, even sunscreens with SPF 15 will block 90 percent of the sun’s UVA and UVB rays. A sunscreen with SPF 30 will block 97 percent of sun rays, and sunscreens with SPF 50 will block 98 percent of the sun’s rays. Sunscreens with an SPF of 100+ provide minimal extra protection—they’ll typically block 99 percent of the sun’s rays. Sunscreens with SPFs higher than 50 also have greater health risks than sunscreens with lower SPFs. Products with higher SPFs need to use more sun-filtering chemicals. These ingredients have been linked to tissue damage and possible hormone disruption. When you’re buying sunscreen for your child, stick to lotions that have an SPF between 30 and 50. Anything in this range will provide them with good protection from the sun. The most important thing is to keep applying sunscreen throughout the day—try to reapply at least every two hours. Aerosol sunscreen sprays are growing in popularity, but in general, it’s best to choose a lotion over a spray. The spray doesn’t provide as much protection as lotion, and your child will need to reapply it much more often. Plus, your child may accidentally inhale the spray, which is full of chemicals. If you do decide to use the spray, apply a lotion to their face, and just use the spray on their body. With so many sunscreen choices out there, it can be difficult to choose a safe sunscreen for your child. Before buying sunscreen, check its ingredients to see if there are any harmful chemicals in it. Also, check the sunscreen’s SPF number. Doing this will help you pick a sunscreen that will keep your little one safe from the sun’s UVA and UVB rays.